Sometime last autumn I got bored with my basic black coffee. I have been through every phase and back when it comes to coffee and these days I prefer it simple and on it’s own. But occaionally I crave something a little different. As a result I reached into the spice cabinet and pulled out the cinnamon. I figured I like cinnamon in tea, and with chocolate, why not give coffee a try? Turns out, it's a combination I really enjoy, especially with more bold flavored brews. For the remainder of the season I drank coffee with cinnamon each morning. You can therefore imagine my delight when I came upon a recipe for a cinnamon brown sugar coffee syrup a few weeks ago. I immediately pinned it and instead of making the syrup I added some cinnamon to my coffee and called it a day. While scrolling through my recipes the other day I was reminded of it and immediately got to work. It’s very quick and easy to make, it took maybe five minutes tops? The most challenging part (for me) was waiting for it to cool. I’m sure that it would taste lovely with a hot cup as well but since it’s summer, it’s been all about iced coffee over here. In a small saucepan over medium heat combine the cinnamon, sugar, and water. Stir constantly until the sugar dissolves and mixture begins to bubble. Once it's bubbling, reduce the heat to low and cook for two minutes. Let cool completely then add to iced coffee. This recipe makes about six and a half tablespoons. I put one and a half in my coffee with some almond milk but I don't think there is a set amount, it's all to taste. You know, I've been a long-time fan of caramel, but I have been getting tired of it lately. I never thought you could make your own syrup, though! Only on pinterest! It sound's very yummy for fall! Oh my looks delicious! I do crave some cinnamon in my coffee sometimes and this would be perfect! Thanks for sharing! I'm trying this tomorrow morning! What a fun recipe idea to mix up my morning coffee!! Thanks for the inspo! Happy Friday! This sounds so delish! Perfect for fall!! Um, how delicious does this sound!! Totally going to try this! YUM! That looks seriously amazing! 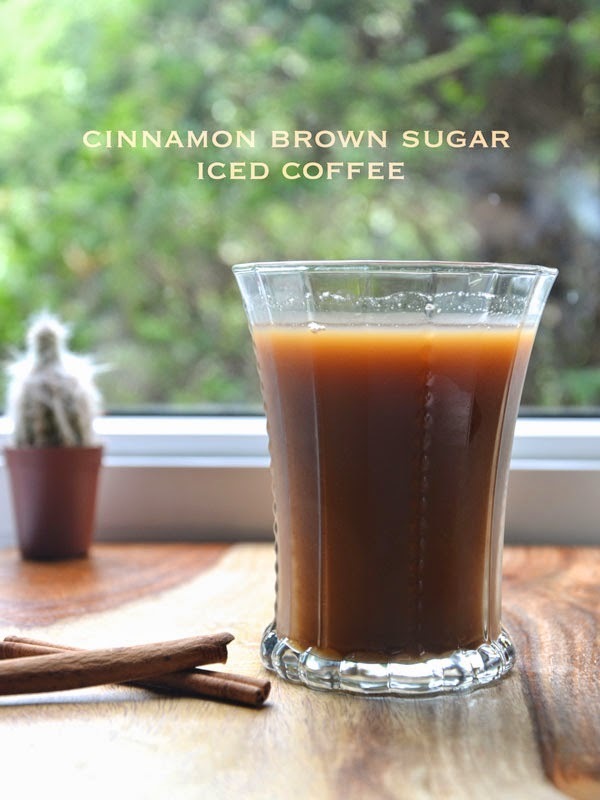 There's nothing like iced coffee in the summer…this looks delicious! oh I need to try this ! Looks really yummy ! This looks super good, I would love to try it. It would be perfect for fall. Yummy, sounds delicious. I may try this over the wknd. Thank you. It looks delicious! Can't wait to try this! I'm a sucker for a cup of good coffee and I'm definitely trying this. Seems delicious. You're recipes are always so good! This definitely sounds like my cup of coffee!!! Wow this sounds tasty! I love brown sugar! Ohh this sounds so good! Sounds perfect for a lazy weekend morning! Wow, Cinnamon coffee. I've never tasted that before. I've tried cinnamon iced tea and I liked it. Since I'm a coffee lover, I'm pretty sure I love this too. Look lovely, would like to try it. Love your blog Lyndsay, I would love if you checked out mine sometime too so we can stay in touch! Yum - I'm a huge coffee snob and a bit of a purist when it comes to my coffee, but this recipe gets my tick of approval! I'll definitely be trying it out soon. Looks yummy! Felt in love with your blog! Oh, I'm always looking for ways to spice up my coffee so I'm not tempted to buy it at Starbucks. I hope you had a great weekend! That looks absolutely delicious, I will have to try that sometime! btw love your blog! This sounds like it would taste amazing. I need to try this. Thanks for sharing girl! This looks delicious, I have my coffee with a milk fluffer, you can find them on amazon, they're amazing!